The President spoke the truth recently when he said "terrible deeds" have been committed in the name of Christianity. We should be equally frank in saying that terrible deeds are now being committed in the name of Islam. For six years, President Obama has refused to connect interpretations of the religion of Islam to the varieties of terror that have emerged in recent decades claiming it as their inspiration. Although anyone who has read or heard about al-Qaeda, Hamas, Hezbollah, the government of Iran, and now ISIS knows that these various groups are inspired by their interpretations of the religion of Islam, the White House continues to speak in euphemisms about a "war on terror" or unspecified "violent extremism." On February 5, however, the President chose to speak clearly and without euphemism about the impact of religion in history at the National Prayer Breakfast. In responding to discussions of the role of radical Islam in this era of terror he said: "Lest we get on our high horse and think this is unique to some other place, remember that during the Crusades and the Inquisition, people committed terrible deeds in the name of Christ. In our home country, slavery and Jim Crow all too often were justified in the name of Christ." Probably because his blunt talk about Christianity contrasted so sharply with White House avoidance of similar frankness regarding Islam, the President received quite a bit of criticism. Some of the criticism appeared to come from those who were reluctant to acknowledge that Obama had simply stated what anyone with a decent knowledge of European and American history knows is the truth. Yet we must give the President credit for being willing to speak the obvious truth about what intellectual and cultural historians call "the labor of selective tradition." The British literary critic Raymond Williams coined the phrase in the 1970s. It captures the efforts of succeeding generations to selectively interpret major traditions, actively shaping them by choosing to accentuate some elements and de-emphasize others. For better or worse, these successors selectively draw on texts or parts of texts that already exist, and in so doing can change the meaning of traditions such as Christianity and Islam. Succeeding generations selectively interpret major traditions, accentuating some elements and de-emphasizing others. President Obama is right that European and American advocates of slavery and, later, American proponents of segregation selectively read key texts of Christianity to justify those practices. Yet, as the President also knows, the opponents of the slave trade in Britain, abolitionists in the United States before the Civil War, and the black churches during the Civil Rights Movement all selectively read the Christian tradition very differently as they opposed enslavement and racial injustice. Both advocates and opponents of slavery and Jim Crow referred to various texts of the Christian tradition to support their views. Just as it would be complacent to argue that Christianity had nothing to do with racial persecution, so it would be mistaken to neglect the enormously important role Christianity played in the movements that worked to oppose slavery and racism. The President did not speak about Christianity, anti-Semitism, and the Holocaust but the concept of the labor of selective tradition is just as evident in the massive scholarship on these subjects. Historians have shown that Hitler and the ideological core of the Nazi regime in the SS were contemptuous of key elements of Christianity, especially the idea, which it inherited from Judaism, that all human beings were God's creation. That religious belief was, they understood, incompatible with biological racism and the notion of a master race. The anti-Christian elements of Nazism were an important aspect of its revolt against Western civilization and played a key role in justifying biologically based racial ideology and policy. Yet historians have also thoroughly documented that Nazism drew sustenance from the long-standing anti-Jewish hatreds that had been constitutive elements of Christianity in both its Catholic and Protestant forms. In Germany, Martin Luther's The Jews and Their Lies played a notorious role in embedding anti-Semitism into the traditions of German nationalism and Protestantism. The notion of an international Jewish conspiracy aimed at the destruction of the Germans that took shape before and during World War II was a secularization and radicalization of the idea of Jews as Christ killers. No serious historian of Nazism and the Holocaust today would deny that along with its pagan, anti-Christians themes, the Nazis' labors of selective tradition also mobilized elements of the Christian tradition in service of their efforts to exterminate Europe's Jews. There is a sober consensus among historians of the Nazi regime along the following lines: Christianity was the most important source of hatred of the Jews in European history. The traditions of anti-Semitism it engendered were essential but not sufficient preconditions for the Holocaust in Europe. Rather, it was only in the historically specific situation created by the Nazi regime in World War II that these specific interpretations of Christianity coalesced into a hatred of unprecedented dimensions. It would be as mistaken to argue that Christianity had nothing to do with Nazism and the Holocaust as it would be to suggest that it was their primary cause. Among its many other aspects, World War II was also a war about the meaning of Christianity. Yet the Nazis did not have a monopoly on the interpretation of Christianity. Among its many other aspects, World War II was also a war about the meaning of Christianity. For both Winston Churchill and Franklin Roosevelt, the war was fought in the name of Christian values that they believed the Nazi regime violated. The idea of a "Judeo-Christian tradition" entered into American culture during and after the war to underscore the connections between Judaism and Christianity and to point to those elements of the Christian tradition that opposed the persecution of the Jews. Indeed, after the signing of the Atlantic Charter off the coast of Newfoundland in 1941, Churchill selected a song for Roosevelt and the assembled military leaders of Britain and the United States to sing together. The song was "Onward Christian Soldiers." Churchill and Roosevelt believed in a Christianity that stood for implacable opposition to Nazi racism and anti-Semitism. Unfortunately, since September 11 the United States government has been unwilling to apply the same standard of criticisms that we have applied to Christianity to the religion of Islam. Yet as with any other large tradition, the labors of selective tradition can be applied to Islam as well. Western governments have tied themselves in knots to the point of foolishness because they refuse to state what is obvious to many millions of people about the importance not of the religion of Islam per se but of interpretations of Islam in this era of terror. Just as it makes no historical sense to discuss slavery or the Holocaust without examining Christianity's contributions, so it is ridiculous to assert that the Islamic State, the Hamas Covenant, the fanaticism of the Iranian mullahs, al-Qaeda, Hezbollah, and the Muslim Brotherhood have nothing to do with Islam. It amounts to saying that its adherents either do not mean what they say or that they don't know what they are doing. Both assumptions are condescending. Western governments refuse to state what is obvious about the importance interpretations of Islam in this era of terror. To be sure, these varieties of Islamism differ from one another, but they all engage in the labors of selective tradition. They did not invent the texts that they quote but they have selected and emphasized some rather than other components of the tradition. They can all point to passages in the Koran and in the commentaries about it that in their view justify attacks on the Jews, on Muslims of whom they disapprove, on Christians and on other assorted "infidels." Bassam Tibi, the author of Islamism and Islam, has described Islamism as an invented tradition. He does not mean that Islamists have invented quotations that do not in fact exist in the Koran and its commentaries. Rather, he means that in selecting some and neglecting other aspects of key texts, they invented a distinctive 20th- and now 21st-century ideology that has fostered fanaticism and violence. Just as historians of Christianity and Western culture have been accused of de-emphasizing faults in Christian doctrine, Tibi and those of us who draw attention to the importance of Islamism have been criticized by people who think we are too soft on Islam. They argue that the main thrust of Islam indeed lends support to the infamous activities of this era's fanatics. Such critics ignore the labor of selective tradition that produced Islamism in our time as well as those many Muslims who reject the message of radical Islam. That said, Western policymakers look like fools when they refuse to state the obvious about the link between some of the traditions of Islam and modern terror. They use terms like "hijack" or "distort" to suggest that the terrorists of ISIS and the others have no connection to any traditions of Islam. They are thus at a loss to explain why the horrific message of hatred has struck a nerve with thousands of radicalized Muslims. They refer to unemployment and poverty but many millions of unemployed and impoverished people around the world do not turn to terrorism while many of those who do are neither unemployed nor impoverished. In the aftermath of the massacre of the staff of Charlie Hebdo and the Jews shopping at the Hyper Cacher market in Paris, France's Prime Minister Manual Valls earned the distinction of being the first Western leader since September 11 other than Benjamin Netanyahu to speak the truth about the cause of such attacks. He did so when he said that France was at war with radical Islam. In other words, France was not at war with Islam but with a distinct interpretation of the religion that inspired these murderers. In making that statement, Valls was applying the same standard of critique that we historians have applied to the history of the West and of Christianity. The refusal by the President and other Western leaders to speak frankly in public about the link between Islamism and terror and the labor of selective tradition that has made it possible has established a double standard in the way we examine religion in history. One standard of sharp criticism is now applied to Christianity while another of excuse, apologia, euphemism, and avoidance is applied to the traditions of Islam. Islamists invented a concept called "Islamophobia" to deflect such criticism. Some have gone further and called for laws that describe any effort to connect Islamism to terror as a form of "blasphemy." Our response to them should be that in our scholarship and in our politics we will adopt the same standard of critique towards the traditions of Islam and Islamism as we have adopted towards Christianity. As a practical matter, we cannot defeat an enemy that we refuse to describe accurately. We should expect that our public discussion of Islam, Islamism, and terror should be no more and no less frank and disconcerting than are the works of historians of Europe and the United States. 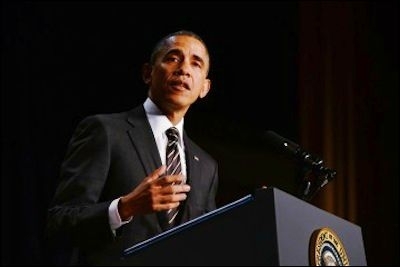 In speaking frankly about Christianity's contribution to injustice and persecution, President Obama unintentionally reminded us that the application of a single standard calls for equally frank public discussion about Islam, Islamism, and terror.